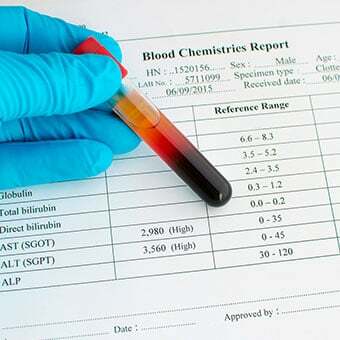 What should I know about bilirubin and blood test? What are symptoms of high bilirubin levels in adults? How do I prepare for the bilirubin test? How is the bilirubin test performed? What are normal bilirubin levels in adults? What do high bilirubin levels in adults mean? What are the symptoms of high bilirubin levels in newborns? What do high bilirubin levels in a newborn mean? What is the treatment for elevated bilirubin in adults? What risks are associated with the bilirubin test? What is the prognosis for newborns? Can high levels of bilirubin be prevented? What is the prognosis for an adult with elevated bilirubin levels? What are other names for bilirubin? Bilirubin is a reddish yellow pigment made during the normal breakdown of red blood cells. Normal levels vary slightly from lab to lab; they range from about 0.2 – 1.2 mg/dL. Signs and symptoms of high bilirubin levels in adults vary with the underlying cause; however, symptoms usually include jaundice and itching. High bilirubin levels in adults usually means that there may be an underlying problem involving the red blood cells, liver, or gallbladder; however, other problems also may be found. Symptoms of high bilirubin levels in newborns are skin and/or scleral jaundice. High bilirubin levels in a newborn means that the neonate is not processing red cell breakdown effectively or an underlying cause is responsible. The treatment for elevated bilirubin in adults depends on the underlying problems. Experts suggest avoiding alcohol. The bilirubin test can chemically determine the total and if needed, the conjugated and unconjugated levels of bilirubin in the blood. The bilirubin test is performed on a small sample of blood from the patient. You prepare for a bilirubin test by refraining from eating for a few hours and avoiding certain compounds that influence bilirubin levels before the test. Risks associated with a bilirubin test are minor. The prognosis for an adult with elevated bilirubin levels is related to the underlying cause, and may range from good to poor. The prognosis for a newborn with elevated bilirubin levels usually is good in the majority of newborns if they rapidly reduce their bilirubin levels. High bilirubin levels can be prevented in neonates by early treatment, and presented in adults by treating the underlying causes and avoiding alcohol or other substances that may damage the liver. Bilirubin is a bile pigment that is orange-yellow in color. It is formed during the normal breakdown of red blood cells (hemoglobin), and is excreted in the bile. Bilirubin can be classified as indirect (free or unconjugated) while it is circulating and is considered as direct after conjugation in the liver with glucuronic acid. The bilirubin test measures the total bilirubin level (unconjugated and conjugated bilirubin) spectrophotometrically. A subset of this test is designed to measure or estimate the two major forms of bilirubin, unconjugated and conjugated bilirubin. Although blood is usually tested, amniotic fluid and urine also can be examined. In addition, newborns can be scanned transcutaneously with a device to check bilirubin levels. In adults, jaundice (yellowish coloration of sclera the eye and/or the skin) and itching are the major symptoms and signs of elevated bilirubin levels in the blood. In general, patients are often asked to fast (only drink water) for several hours before the test. Avoid strenuous exercise before the test as this may elevate bilirubin levels. Avoid drugs such as caffeine, penicillin, salicylates, and others as they can decrease bilirubin levels. The test is performed by withdrawing a small amount of blood from the individual. This blood sample is then chemically screened for bilirubin. Chemically, subset test can determine both unconjugated and conjugated bilirubin levels. Normal values of direct bilirubin range from 0 to 0.4 mg/dL. Total bilirubin (direct and indirect) range from about 0.2 to 1.2 mg/dL (some lab values range as high as 1.9 mg/dL). Medical literature sources have minor variations in "normal" levels). Low levels of bilirubin may be due to certain medications such as theophylline (Elixophyllin, Theo-24), phenobarbital, and increased vitamin C levels. High bilirubin level in the newborns usually is indicated by jaundice of the skin, usually appearing on the face and forehead first, and later spreading to the trunk and extremities. Other changes such as drowsiness, seizures and altered crying may occur if high levels persist. Some newborns may have petechiae, an enlarged spleen and anemia due to hemolysis and can progress to develop neurologic problems or even death. Experts suggest avoiding alcohol consumption to prevent further liver toxicity. The risks associated with this test are minor; and consist of potential infection at the blood withdrawal site, and possible bruising at the site. In general, newborns have a good outcome if the bilirubin levels decrease quickly (over a few days); however, the prognosis is not good if the newborn has persistently high bilirubin levels. High levels of bilirubin may be prevented in neonates by appropriate treatment. Primary therapy for newborns is phototherapy, followed by exchange transfusions and intravenous immunoglobulin. Your newborn's pediatrician will help manage your newborn's bilirubin levels. Management of high levels of bilirubin in adults vary with the underlying cause. In general, though, adults with elevated bilirubin levels are urged not to drink alcohol, and to avoid any compounds that may harm or stress the liver's function. Your health-care professional can help you determine what you should do, and what you should avoid depending on your underlying problem that is causing the elevated bilirubin levels. The prognosis in an adult with high bilirubin levels may range from good to poor, depending upon the underlying cause of the elevation. For example, most hepatitis A patients recover completely while patients with liver cancer or cirrhosis may have a poorer outcome. Bilirubin – a term that means any form of a yellowish pigment made in the liver when red blood cells are broken down and normally excreted with the bile; also termed "total bilirubin." Bilirubin can be classified as indirect while it is circulating in the body. In this form it may also be termed "free" or "unconjugated bilirubin." Bilirubin can be classified as direct after conjugation in the liver with glucuronic acid. This form may also be termed "conjugated bilirubin." Nazer, H. "Unconjugated Hyperbilirubinemia." Medscape. Updated May 02, 2016. Weisinger, R. "Conjugated Hyperbilirubinemia." Medscape. Updated Jan 05, 2016. American Association for Clinical Chemistry. "Bilirubin." Updated Sep 17, 2015.